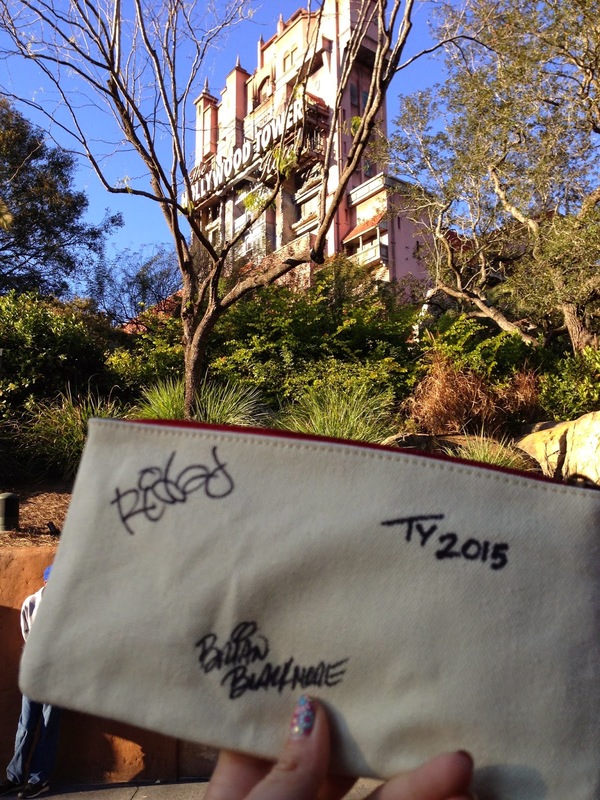 Weekend Wear-abouts: Part 2- All Four Parks + Monorail Bar Crawl + More! Thanks for coming back around to check out Part 2 of last weekend's Weekend Wear-abouts. You can find Part 1 here. This is particularly special, and I'll tell you why. 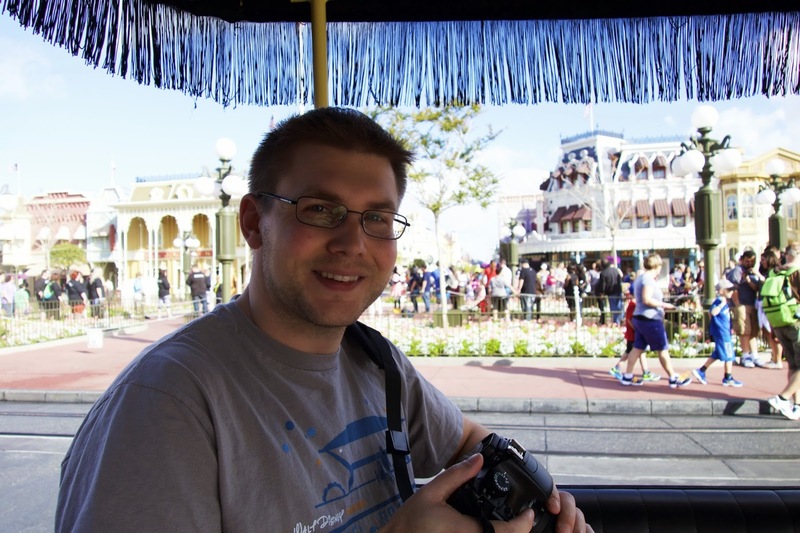 John likes Disney, mostly tolerates it for me, but likes it. He does not, however, like the Magic Kingdom. I think he appreciates it for nostalgia's sake, but the crowds, kids, parades that block the streets, and effort it takes just to get there really turns him off. However, about a year ago, he and I went one cool, sunny day at park opening. We took lots of photos and had pockets of the park to ourselves for the first hour or so. He really, really enjoyed himself. Here's some photos from that day. Aww, while looking back at those, I realized that it must have been in early January of last year, as the Christmas decorations are still up. Awww! And the hanging garland was still up across Main Street! (RIP). AND we rode the Omnibus. 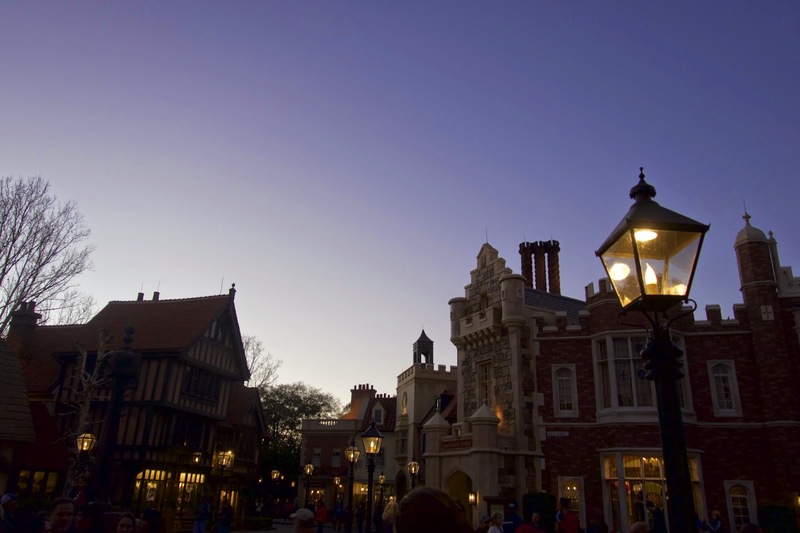 AND the trees were still along the walkway from Sleepy Hollow to Fantasyland along the castle- I miss them! 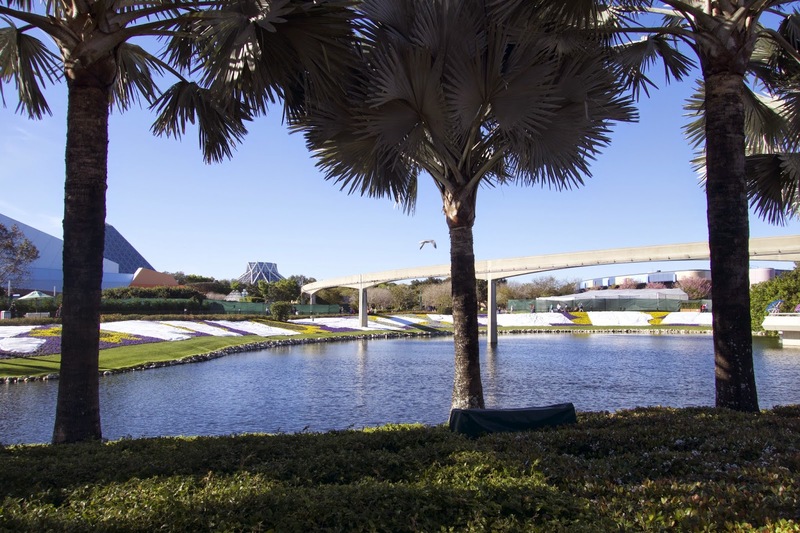 I wish the Hub still had trees. They just give it such a warm fuzzy feeling. That's probably one reason why Disneyland feels so good to me. But I digress. So I've been waiting for a cool, sunny day to roll around again in order to convince him to take one of his precious, well-deserved weekend days and get up early to visit his least favorite park. Sunday was the day! It was pleasantly cool enough but warm enough to wear shorts, hooray! I'd been waiting to wear my new Calahans since getting them from the Lilly Pulitzer After Party Sale in January. We arrived just after the welcome show. Upon entering Town Square, the surrey was sitting in front of the train station. We jumped on, and to our pleasant surprise, the driver got in and started on our way. Our own private surrey ride up Main Street! 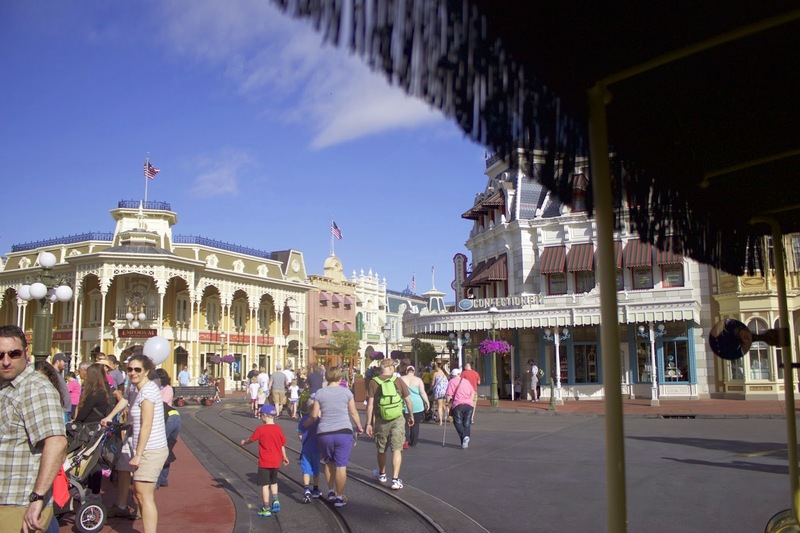 Here's a snippet of video from our trip up Main Street. It was so awesome. People were looking at us, saying things like, "VIP, eh?!" "Wow, you must be special!" I waved as we passed. We made it to the castle and our driver (trying to remember his name, Edgar maybe? He was fantastic.) jumped out and had us sit in the drivers seat for a photo op. He then had us get out and stand in front of the castle for photos. 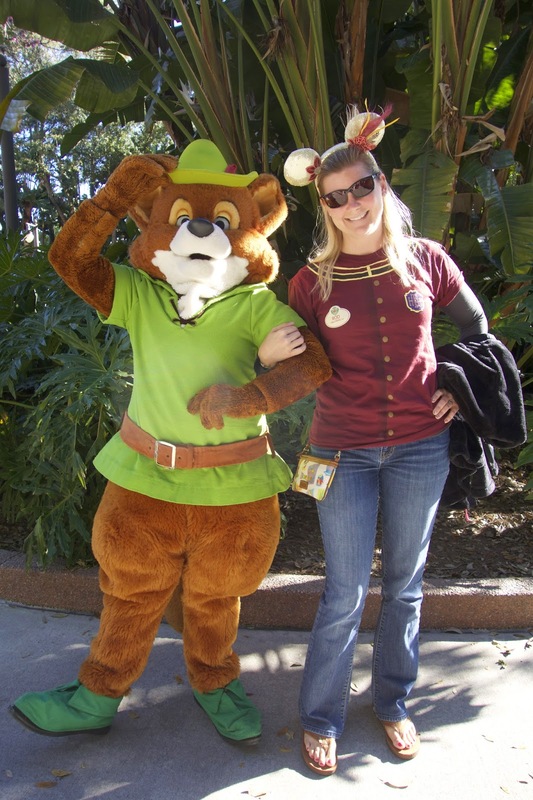 He used our camera, and Photopass was there. It was really neat. And it was perfect because our first FastPass was for Space Mountain! We headed there and walked right on. Pro tip: you rarely need a FastPass for most attractions the first 30 minutes of the day. Frozen stuff, Peter Pan, Mine Train, yes. But most others, no. The cool thing here was that we had our own space shuttle on Space Mountain! We asked for the back seats, and had no one in front of us. VIP for the second time! Exiting that, we sauntered over toward Liberty Square, sharing a banana on the way. As we entered Liberty Square, I suggested Haunted Mansion. Right then, the Liberty Belle pulled up to the dock. John had never done that, so our decision was made. I grabbed a pickle from the Liberty Square Market, and we hopped on. We found a bench on the second level. And then, the ropes were closed behind us. No one else was on the boat. VIP part three! I was SO EXCITED! 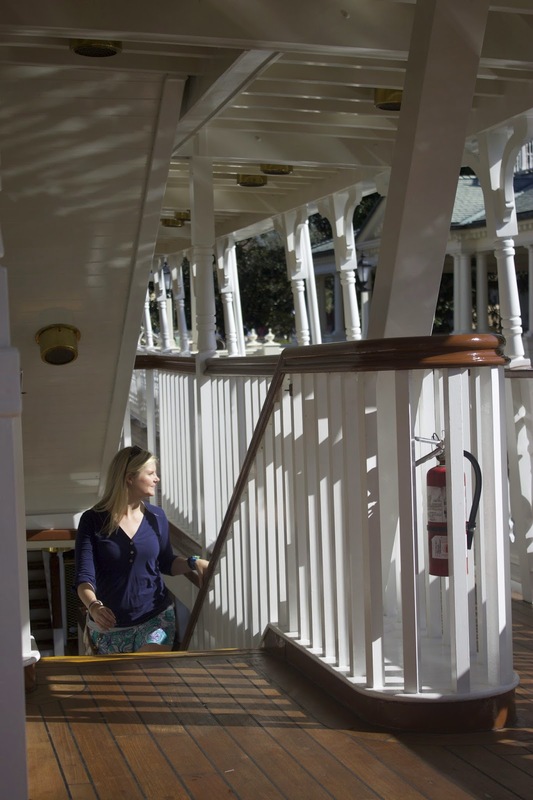 Who gets the entire Liberty Belle to themselves? Like, when does that happen?! It was perfect. After a lovely trip around the Rivers of America, we headed toward Adventureland to do yet another first for John-- the Enchanted Tiki Room. 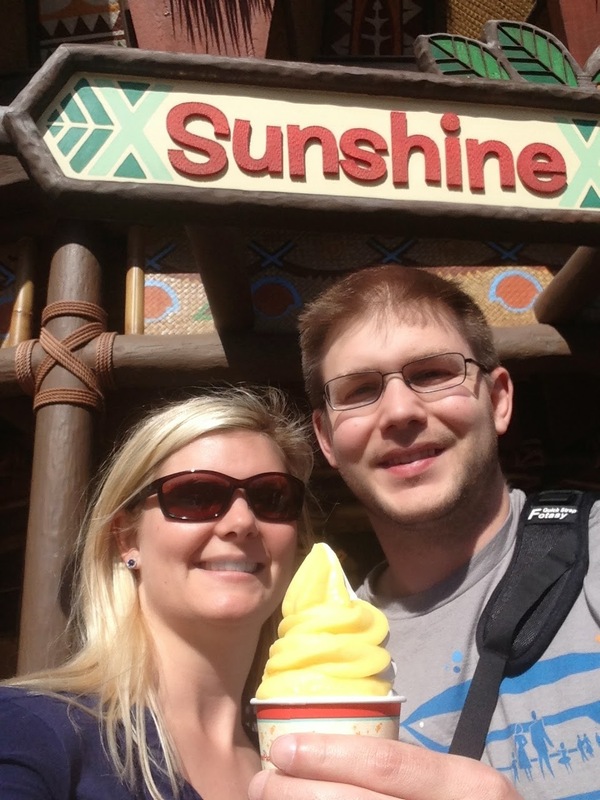 First, we split a Citrus Swirl. 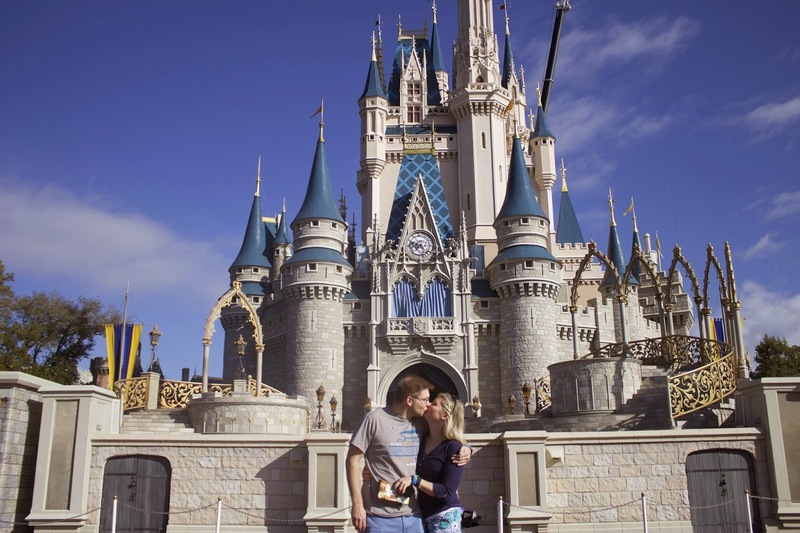 What's better than sharing an iconic treat with your love in the Magic Kingdom?? Not too much. One reason I wanted to do this particular attraction was because of John's Instagram name. He created it based on Sacha Baron Cohen's character, Bruno. 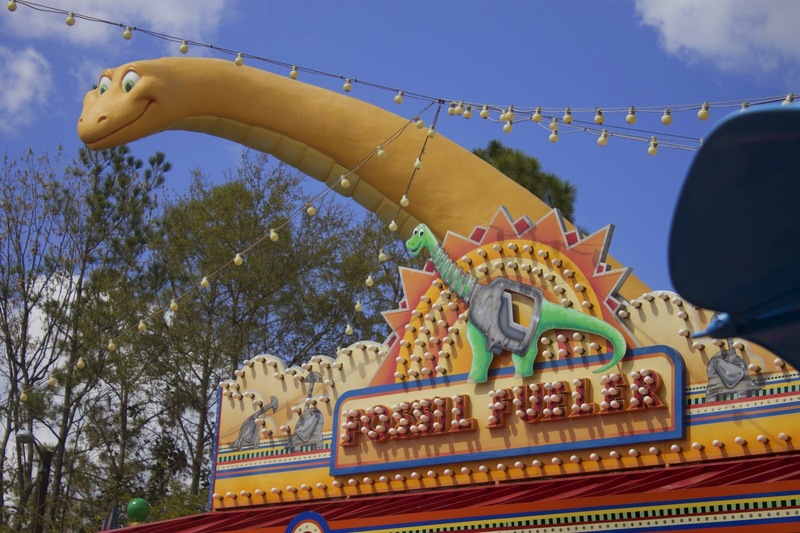 But *I* like to pretend he did is as a subtle Disney nod to Fritz in the Tiki Room. It was great, as always. 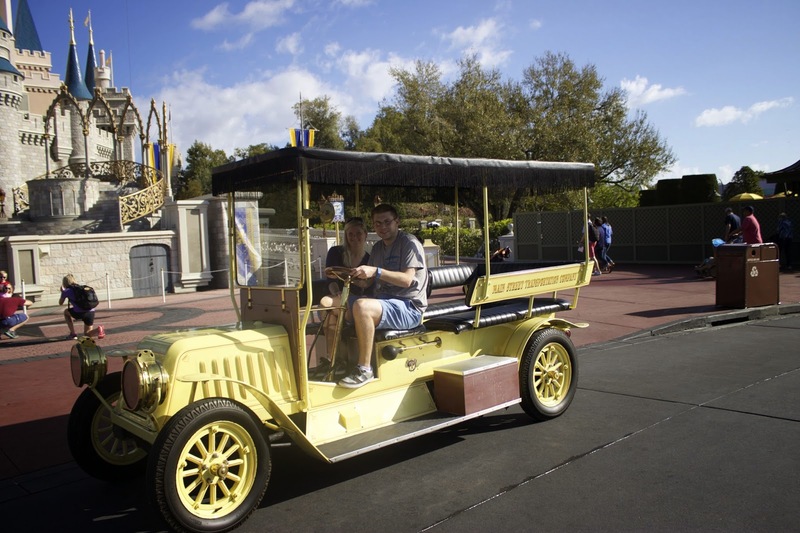 By then, it was pushing noon o'clock and we had plans to meet my brother and family at Animal Kingdom. On the way in, I saw two interesting things. 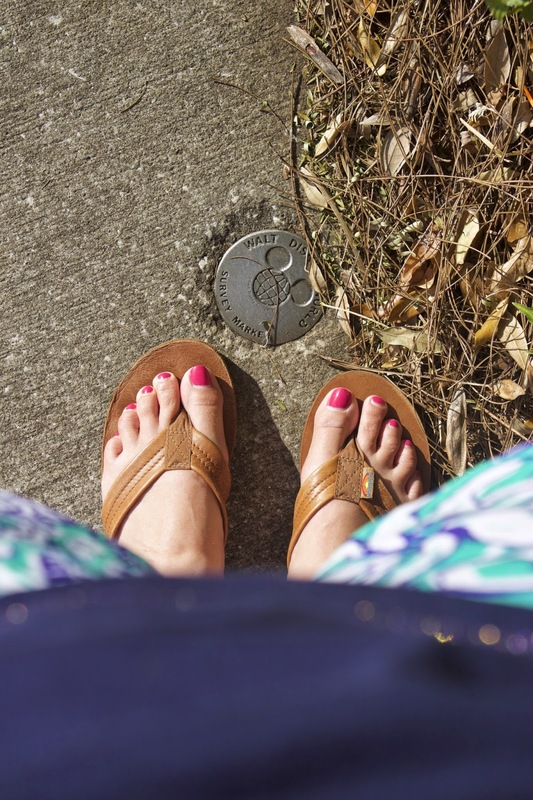 The first was a survey marker. The second was a really comfortable looking pair of sneakers. 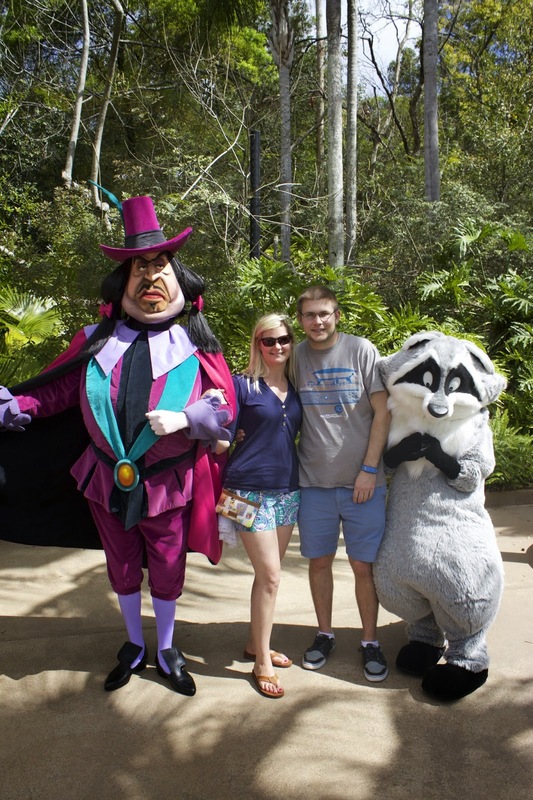 Arriving at DAK, I was happy to see Governor Ratcliff and Meeko out front for a meet and greet. Here goes this 'not really a character gal,' meeting characters. John was sweet enough to join in the photo so I don't always look like a loser all alone in my pictures. 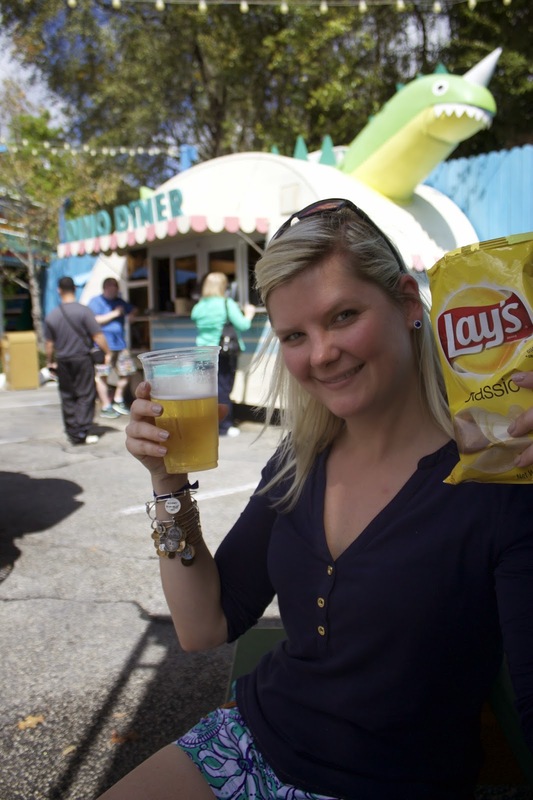 We joined up with the crew in Dinoland and John and I split a bag of Lays and each had a beer while my brother and niece played the carnival games. 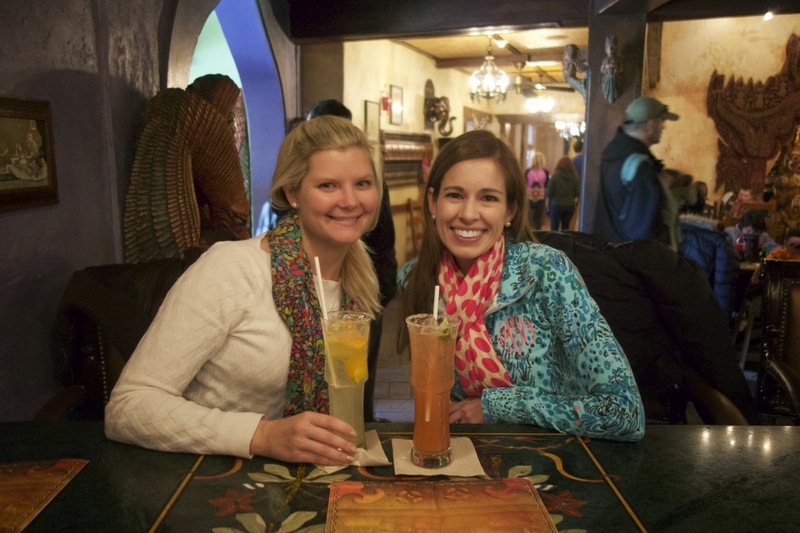 Then we went to Dawa Bar to celebrate National Margarita Day, while my brother and co. did the Safari. The Dawa Bar was bumping, as always, but bartenders Sam and Bob from Boston were keeping up and taking care of business. I happened to score a seat at the bar, and struck up a conversation with a couple sitting next to me. Ends up they're from California, and the guy is the photographer for the Walt Disney Family Museum! Hi Frank! Two margaritas later, it was time for lunch. We had ADR's at Yak & Yeti. Yummy as always. John and I headed out after that, so he could have some of his Sunday left to relax at home. I love my little homebody. On Monday, I got up early and picked up niece Amelia to rope drop MGM, her favorite park. 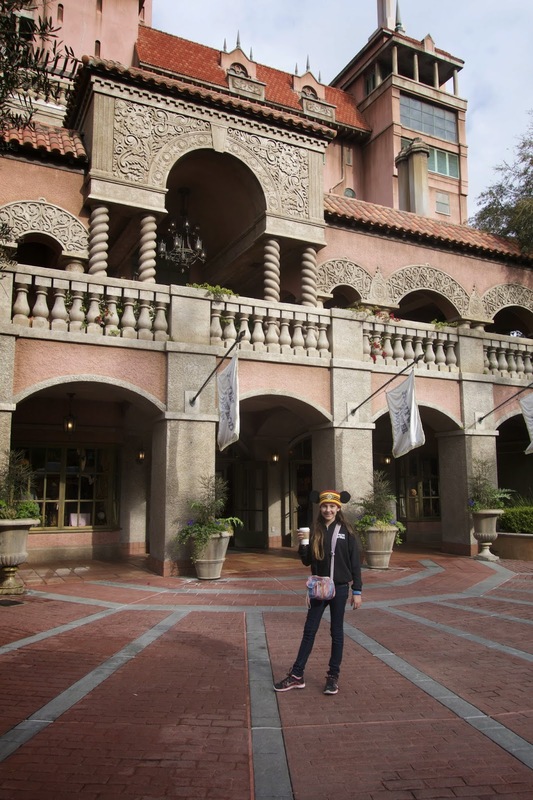 We headed straight to Tower of Terror, only to be met with a bellhop telling us it was down. So, it was back to Trolley Car Cafe for Starbucks. Coffee and tea in hands, we walked back down to Tower to sit and wait for it to open. After splitting a breakfast sandwich and finishing our drinks, it still wasn't operating. Amelia really wanted to see the new ToT merch, so we asked if we could at least go back to the gift shop. Now, mind you, the CM's were stopping people out by the wait time sign, not up by the actual queue entrance gates. So we had the entire ToT courtyard area and gift shop to ourselves. Amelia spend a good thirty minutes perusing the merchandise. About then, a few people started to trickle into the gift shop. I heard a rumbling in the building, and Amelia and I looked at each other with a knowing look in our eyes. The ride had opened! We paid for our goods and rushed out to the queue. Only one side of the ride was running, so the wait was 45 minutes, but it was no question that we were doing it because it's Amelia's favorite. After that, we did Rock n' Rollercoaster. Then we grabbed some lunch and headed out to meet by brother and sis-in-law to drop off Amelia. Thus ended the extended weekend. As always, it was busy and fun. 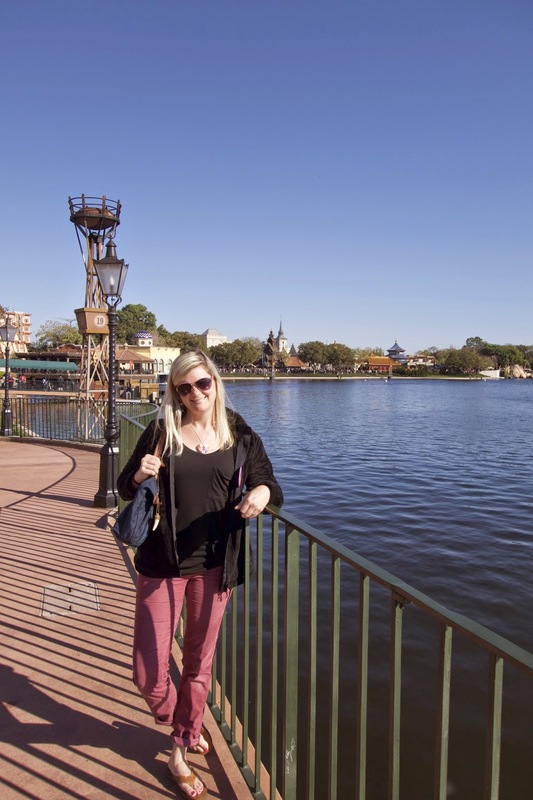 Weekend Wear-abouts: Part 1- All Four Parks + Monorail Bar Crawl + More! Grab a cuppa and settle in- this one's a doozie. Let's call this the 'Extended Version' of Weekend Wear-abouts, as it encompasses Thursday through Monday. In fact, it's so full, I'm gonna split it into two posts. This is Part 1. You can see Part 2 here. Get ready for lots of pictures. Here goes! Thursday started out freezing but sunny- and really, not just 'cold' to this Floridian, but 'high in the 50's and wind chill in the 40's' cold. 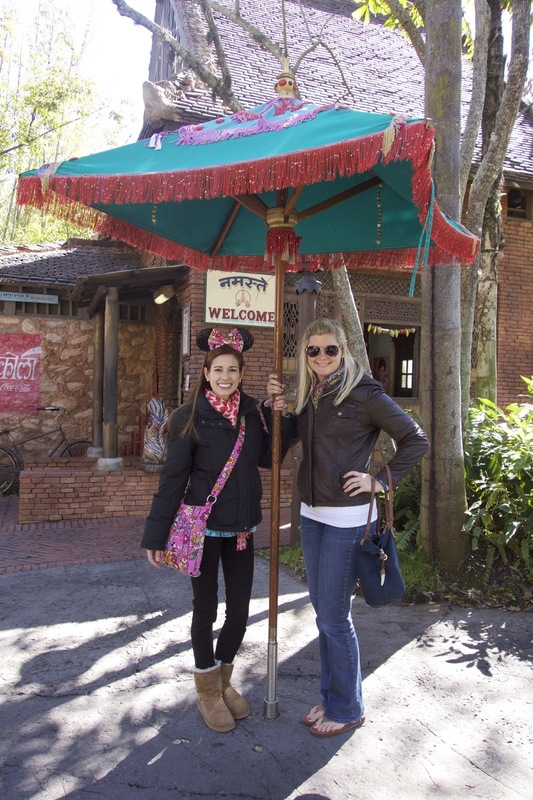 I had plans to meet up with my Lilly-lovin' friend Amanda from Dixie Delights at Disney's Animal Kingdom, but texted her to see if she wanted to move our meet up to an indoor location. She's a trooper, and donned her down jacket and Uggs, and off we went. She had been wanting to try the famed Dawa Bar Bloody Mary, and who am I to deny anybody that pleasure? 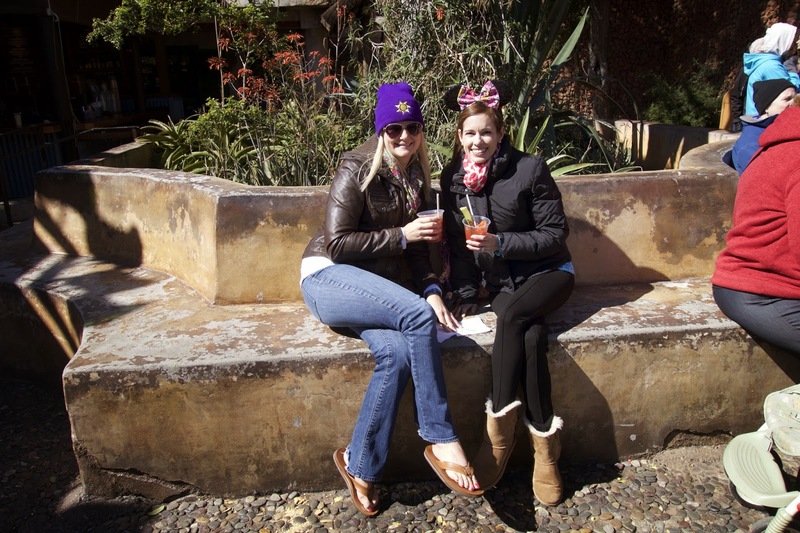 We sat in the sun, sipped, and chatted, then made our way over to meet Minnie and Mickey in their safari gear. We had over an hour to kill before our Expedition Everest FP, so we settled in at the Yak & Yeti bar and ordered another round. Amanda had the Pink Himalayan and I had the Rickshaw Rickie. After outrunning the Yeti on Everest (which actually felt like we were in the mountains in the Himalayans- roller coasters + windchill= cold! 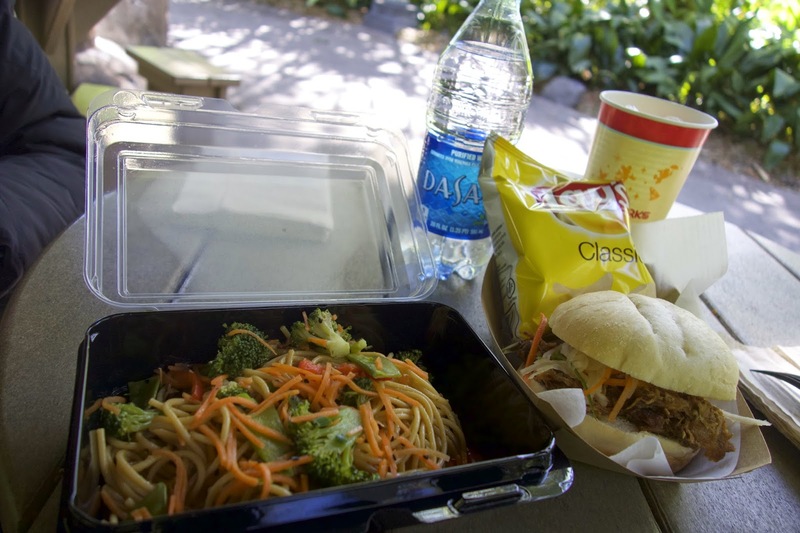 ), we split an Asian noodle salad and Thai pulled pork sandwich for lunch before taking a safari though Africa. 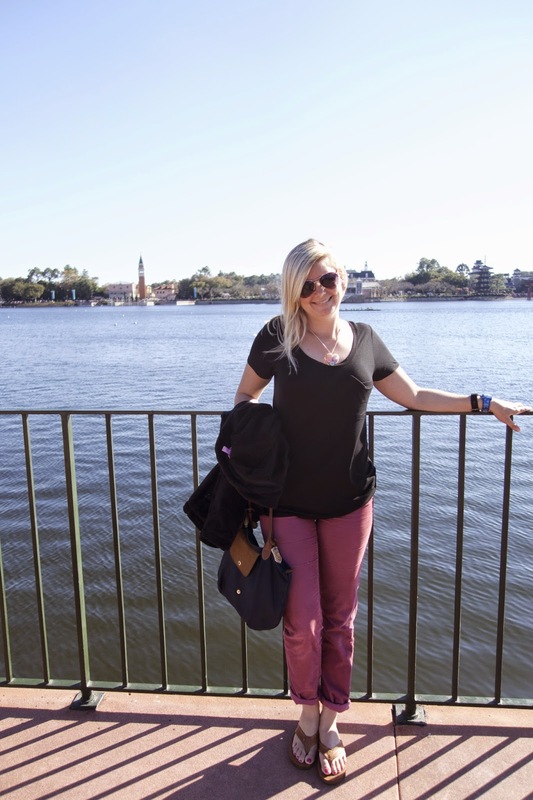 Amanda was running the Princess 5K & 10K, so I took her back to meet up with her friends at theCarribbean Beach Resort, and headed to Epcot to see if anything was going on in celebration of Chinese New Year. I picked up a latte at Starbucks, and was pleasantly surprised to see they now offer coconut milk. I use this in my morning coffee, so I'm excited to have it as an option at the 'Bucks. I also snacked on a warm strawberry jam filled waffle at Kringla bakery cafe in Norway. 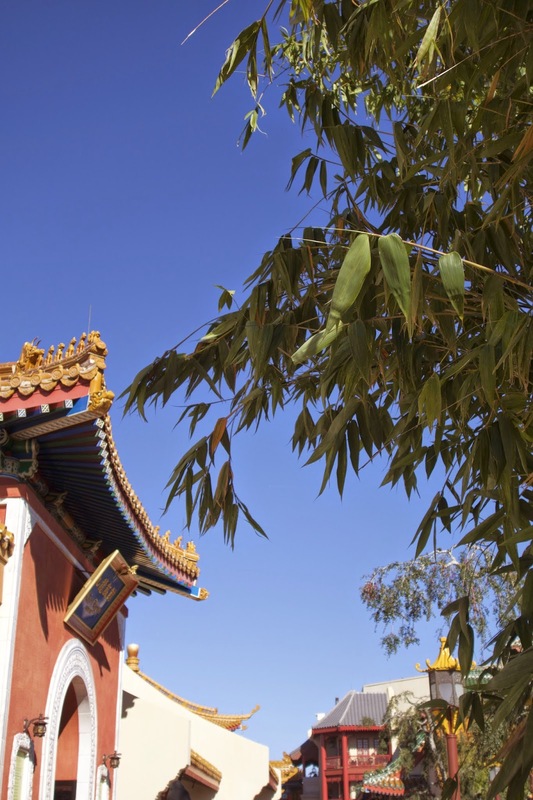 Sadly, I didn't see anything happening at the China pavilion. 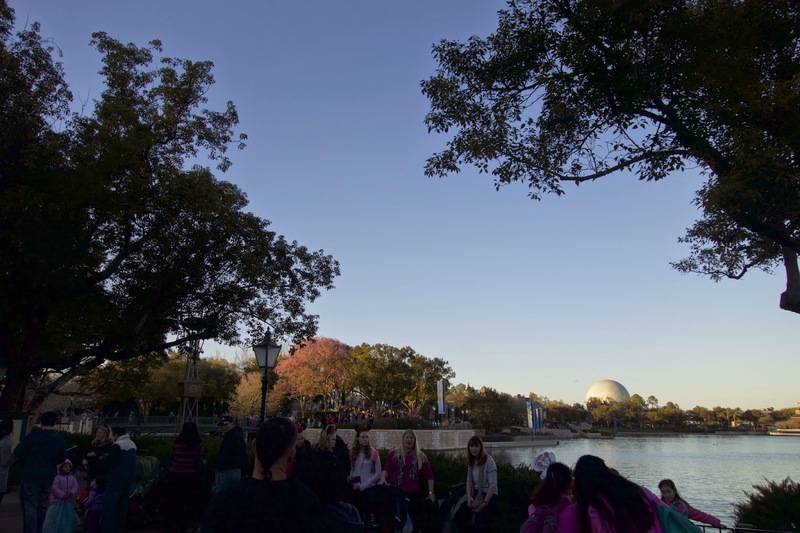 DCA had a full-on special event running to celebrate the New Year, but Epcot didn't do a thing. You Californians get all the good stuff, I tell ya. 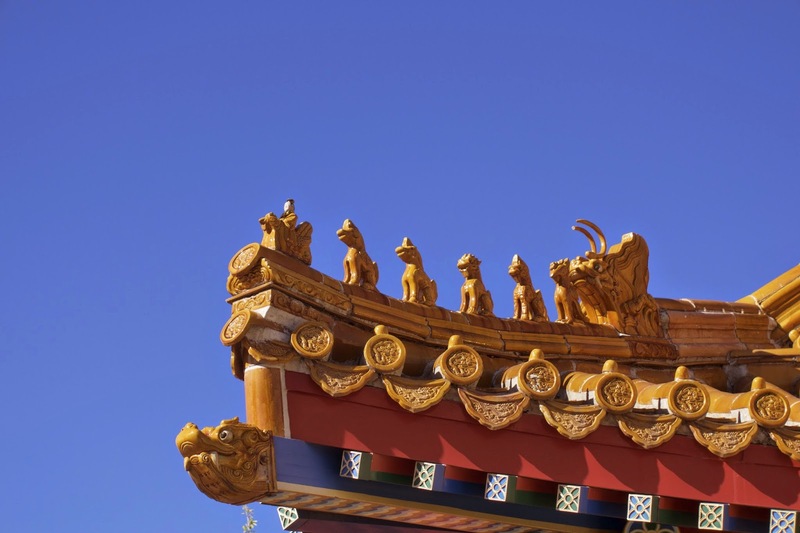 I had just listened to Lou Mongello's WDW Radio podcast (from 2008) about the China pavilion, and heard this tidbit about the details along the roofline, pictured below. Apparently the man sitting on the chicken is Prince Min, a third-century ruler who was hanged due to the cruelty he imposed upon his subjects. It's customary to install and effigy to him among building in China as a warning to other tyrants. The animals lined up behind him are to keep him from trying to escape. Disney details! 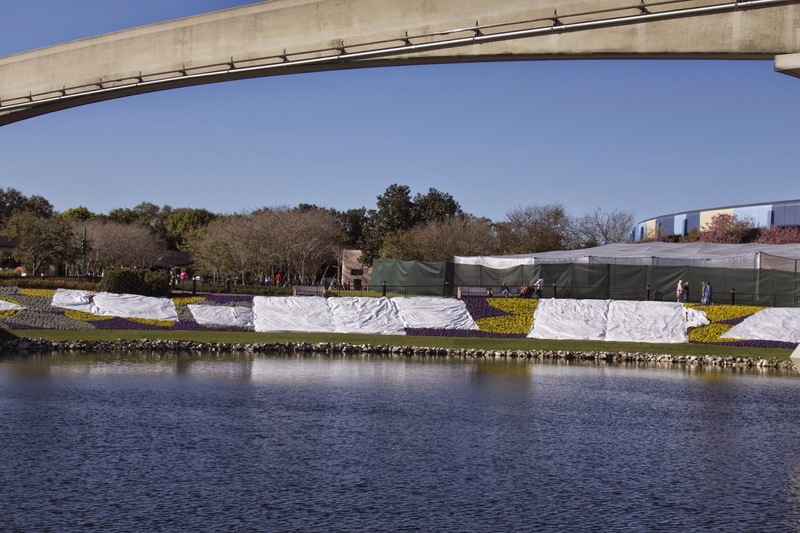 On the way out, I snapped some pics of Epcot getting ready for the Flower and Garden Festival. 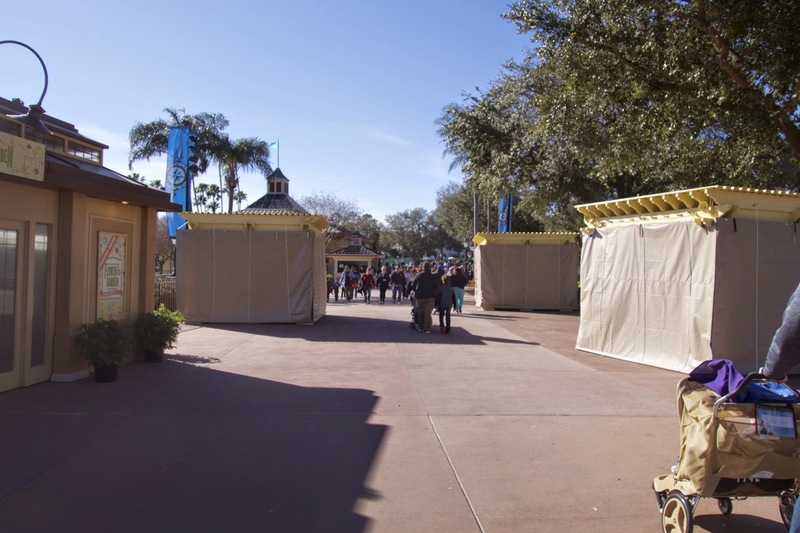 The food booths are up, and the flower beds are planted. Not sure if they were covered because of the cold, or because they were still under preparations. Needless to say, I can't wait! I really love the Flower & Garden Fest. Friday was a park-free day, filled with 'real world' responsibilities like grocery shopping, laundry and the like. 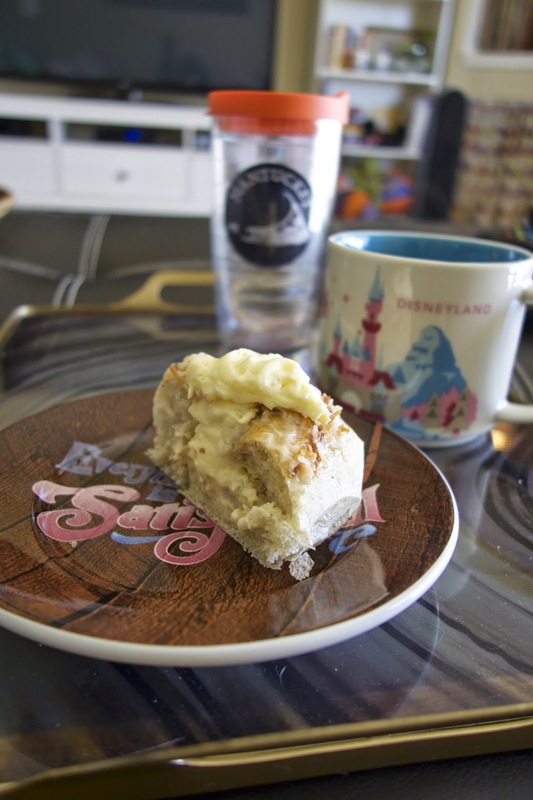 But I still had School Bread and a Disney plate and mug, so *take that*, reality! 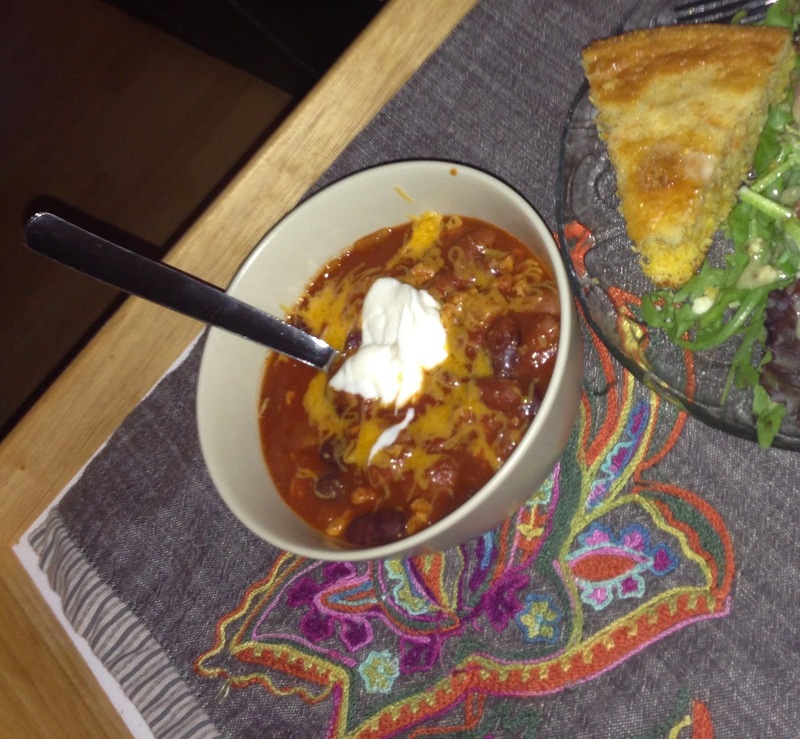 It was another cold day, so I made chili and from-scratch cornbread for dinner, and John and I watched Harry Potter and the Deathly Hallows, Part 1. We've been working our way through the series (neither of us had seen them all before), and I'm bummed we're almost done! I'm going to read the books though. I've heard, and it always rings true, that the books are better than the movie. My brother's family drove up on Saturday, and I met them at the Contemporary for lunch at Contempo Cafe. 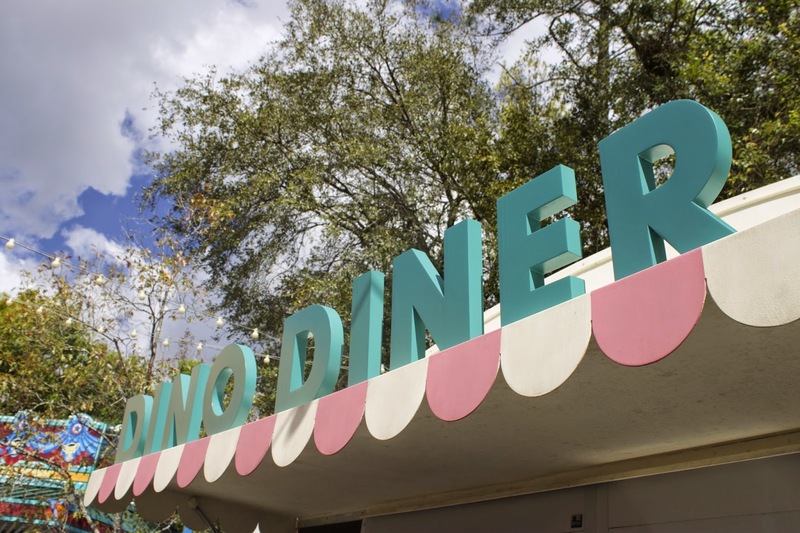 I don't have a picture of it, but I ordered the tuna salad platter off the kid's menu, and it was tasty and filling for a really good price ($5.99, which in Disney terms is practically a steal). The kid's meals come with two sides and a drink, so if you're a light eater like me (I mean, I love to eat and eat a lot, but I eat little bits all throughout the day), it's perfect. 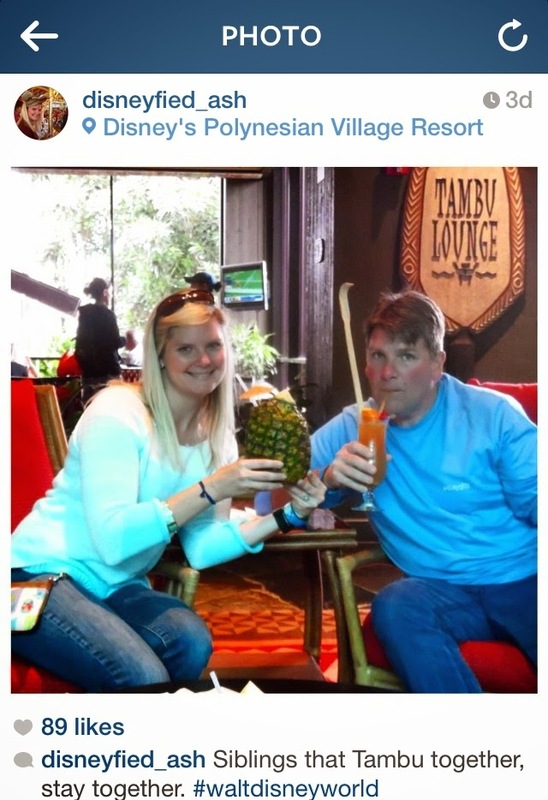 We planned to head right back into the Magic Kingdom, but decided to stop by The Wave lounge for a drink before hand. 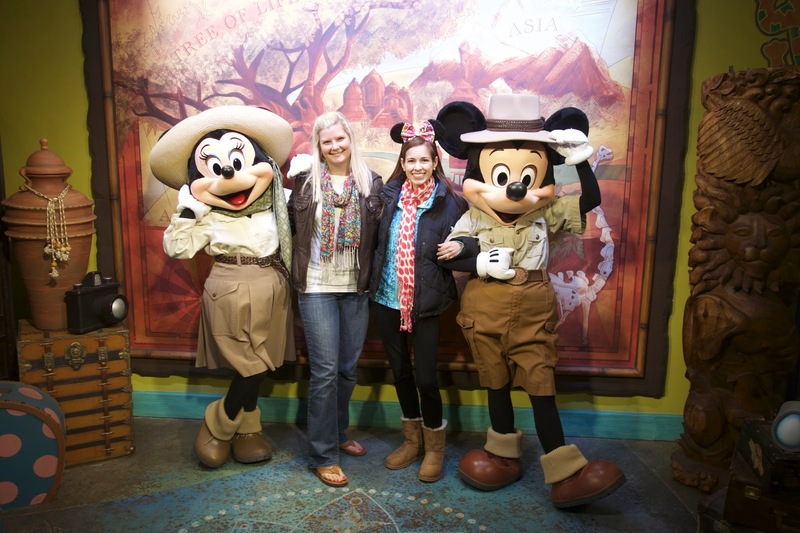 While there, I was telling my sister-in-law and her friend (who's first visit it was to Disney!) 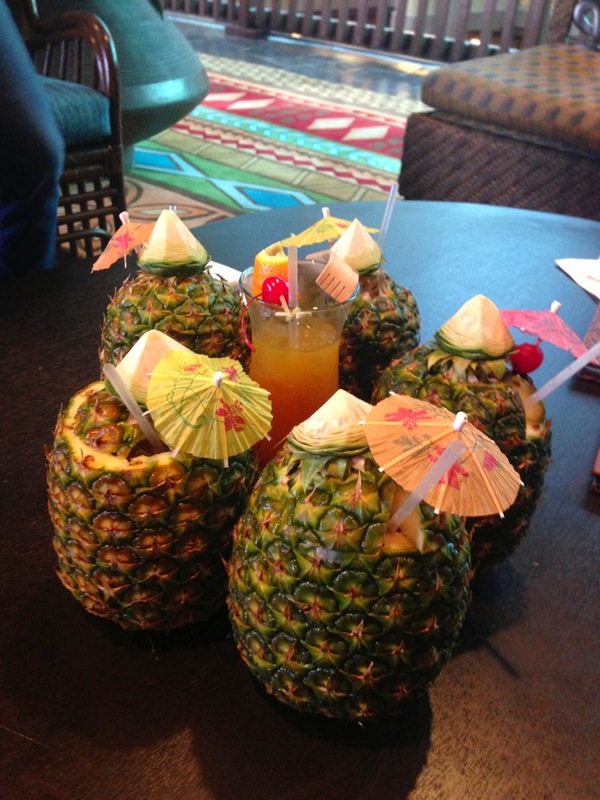 about the Lapu Lapu's. 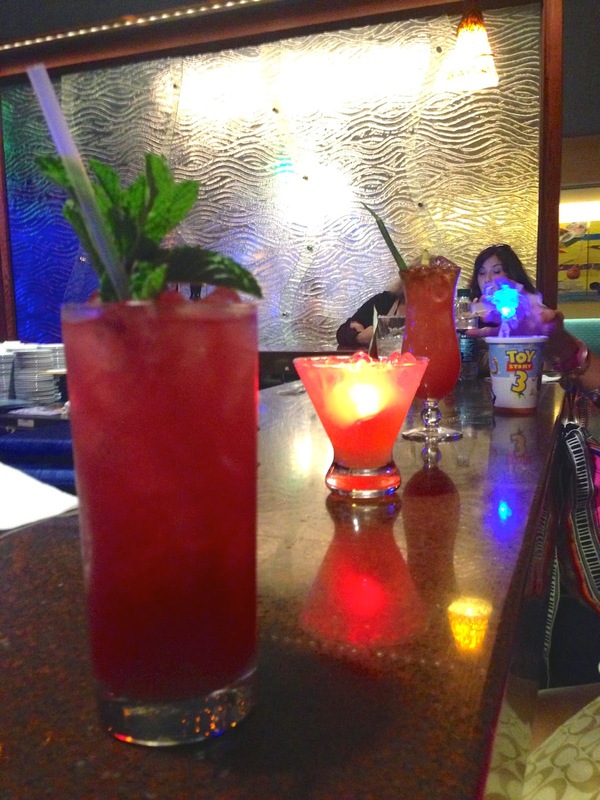 We decided that we needed to have one, so after finishing our drinks, we monorailed over to the Poly. While there, I convinced them that we might as well complete the monorail bar crawl trifecta and hit up Mizner's at the Grand Floridian. We arrived there just before it opened, at 4:30. 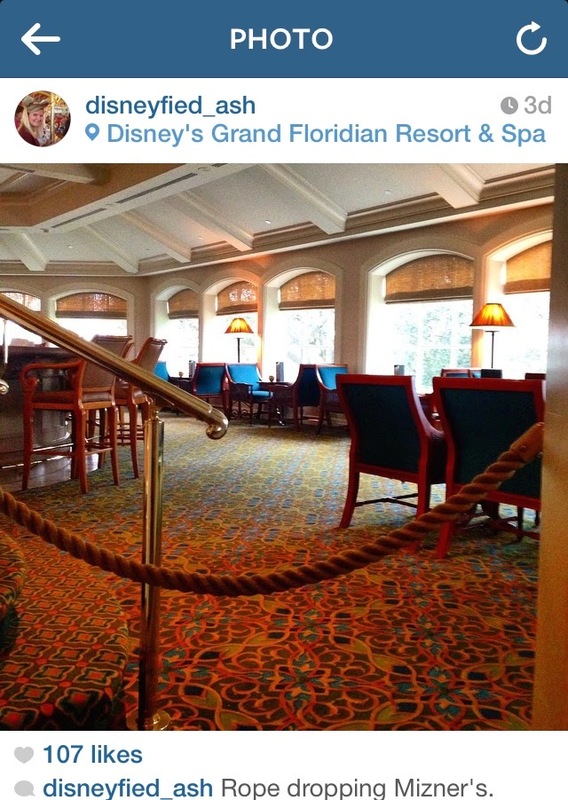 I've rope dropped a few things in my Disney experiences, but never a bar! As soon as the ropes were opened, people flooded the place. There wasn't an empty seat in the house! We enjoyed a drink and some munchies, then finally headed to MK. My brother and crew called it an early night (they had been up since 5 am and rope dropped MK at 8 am), so my niece Amelia and I continued on without them. 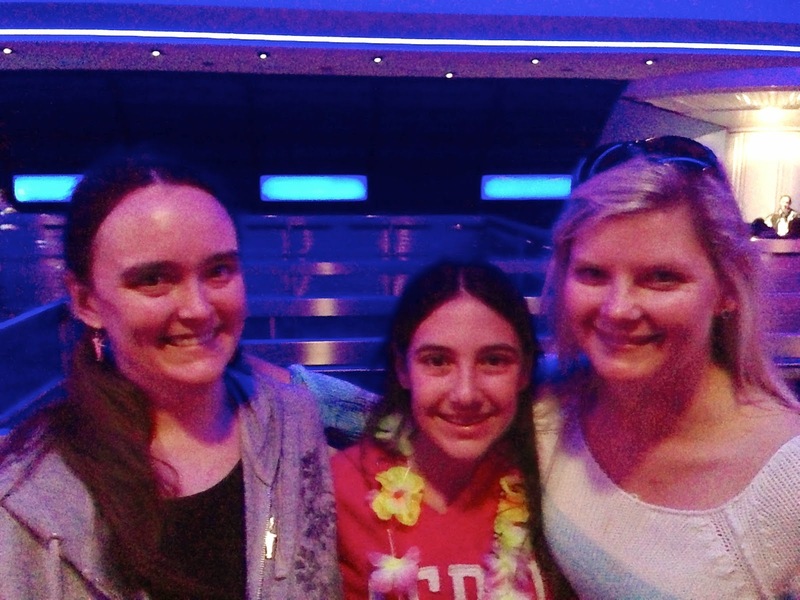 We met up with my friend Tink (my good ol' '24-hour-Disney-day' pal) and her beau, and slid in on Peter Pan and Space Mountain with their FastPasses. Finally, it was time to drop my niece off and head home. John and I had an early morning planned for Sunday. We were rope dropping the Magic Kingdom! Check back soon for Part 2, where we felt like VIP's in the House of Mouse. Hope you had a lovely Valentine's Day weekend, whether you're a single lady (or fella) or paired up. 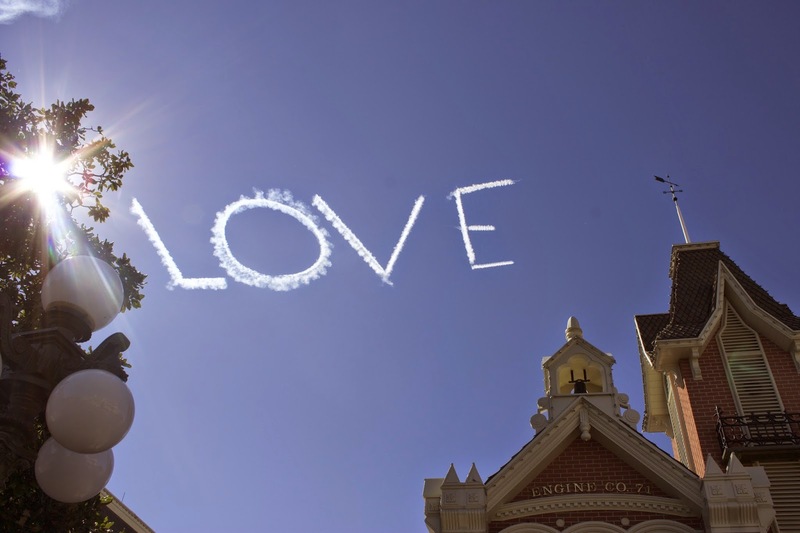 Either way, it should have been filled with love! My weekend started out on Friday with a yummy red and pink breakfast on my new favorite plate. Cherries and homemade raspberry cream cheese on toast, yum! 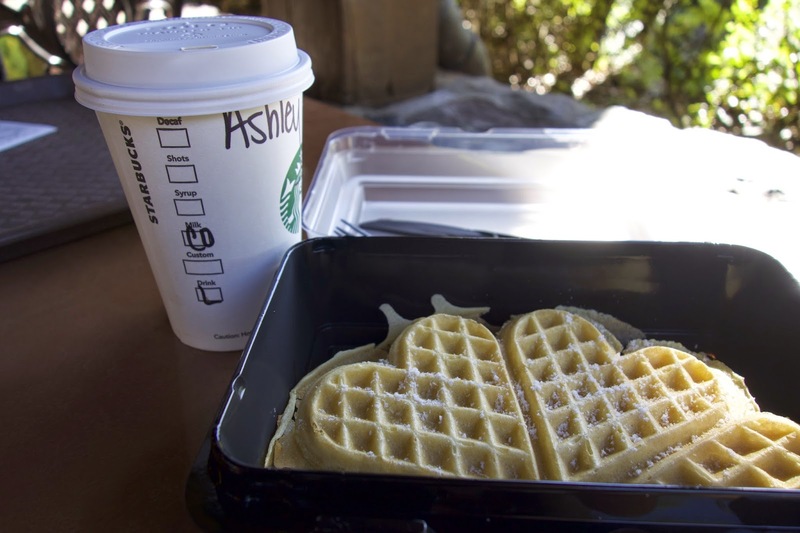 If you want some other inspiration for things on toast, check out Drea's blog here. After breakfast, I headed to DHS for the new Tower of Terror merchandise reveal. 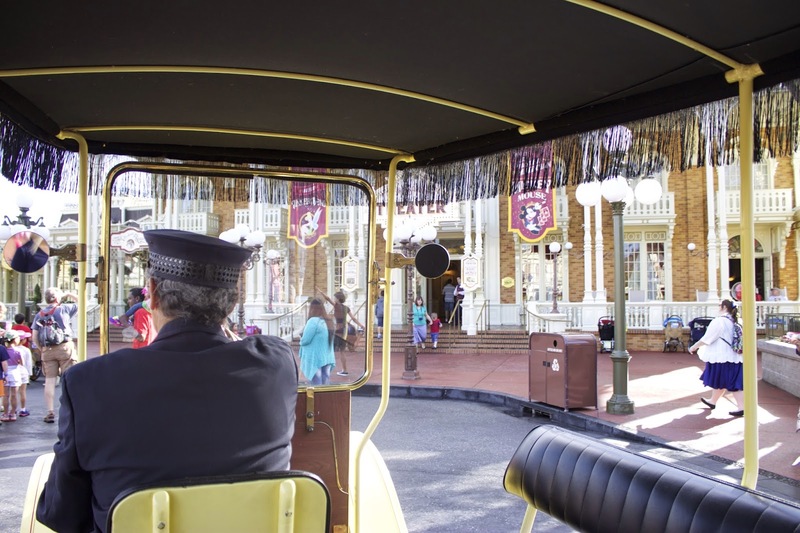 I noticed some seating has been added behind the new Starbucks Trolley Car Cafe. This is nice, but I was hoping they'd bring back the cool old car that used to be under the canopy. With a few minutes to spare before the event started, I walked back into the Fantasmic exit area and was happy to see Robin Hood out greeting. I've said it before and I'll say it again; I'm really not much for character meet and greets, but this 'Characterpalooza' they have at DHS every afternoon usually has some unique characters. And no lines. Both times I've stumbled upon it, it's been around 3:30 or so. 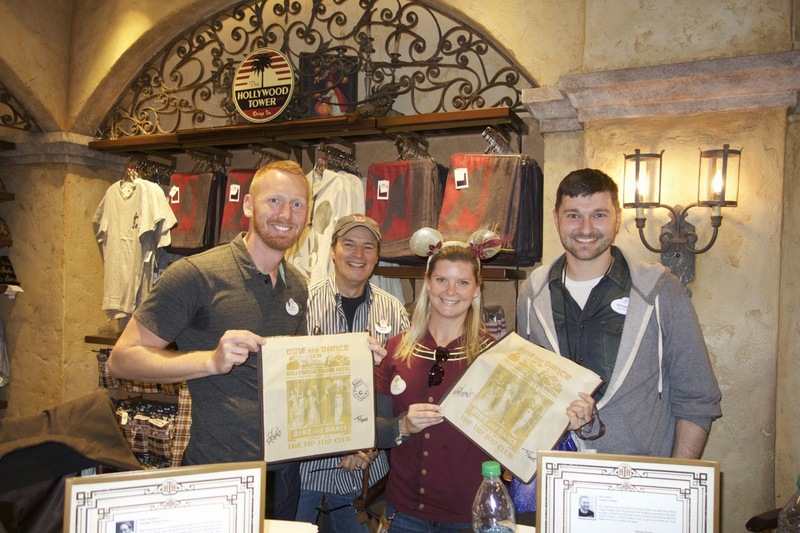 On this particular day they closed up around 4, but were open again around 4:30.
Who's the dork who dresses for ToT merch reveal? Me! Here are just a few of the new items. I'm just now noticing that I featured three bags in my photo, but they were really cool! There were also several new t-shirts, glassware, artwork and more. 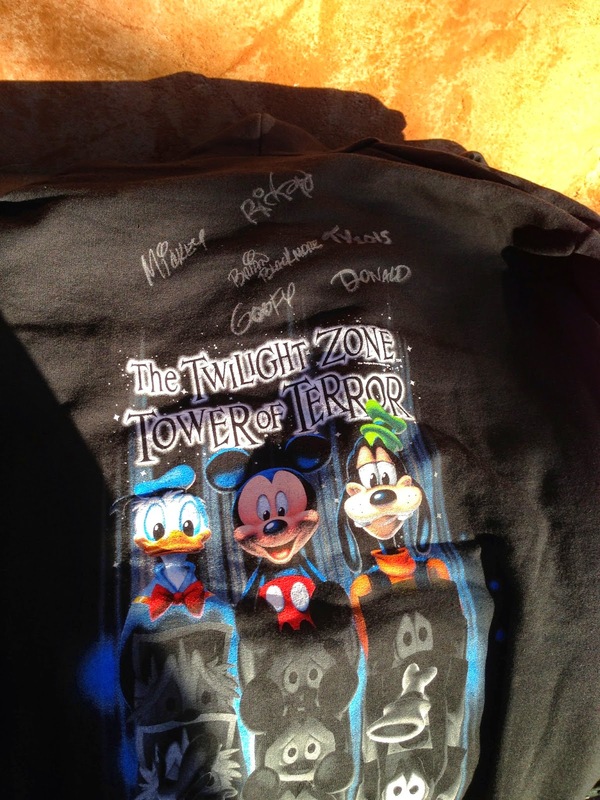 The 'dropping character' line of merch (the one that shows Donald, Mickey and Goofy dropping in the elevator) has also been expanded to include an orange tshirt and a hoodie option. I got my goodies signed by the artists and designers. I also got a few things for my ToT obsessed niece, including the sweatshirt and wristlet, below. 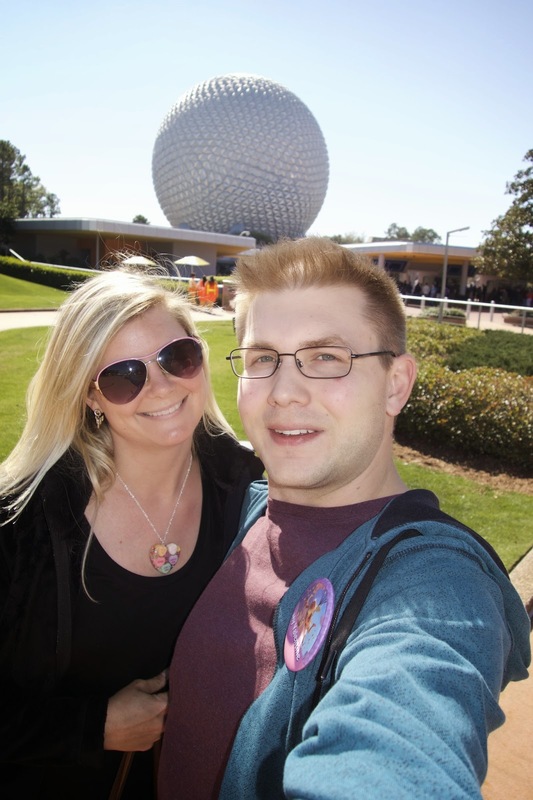 Saturday was Valentine's Day, so my valentine and I went to Epcot to celebrate. 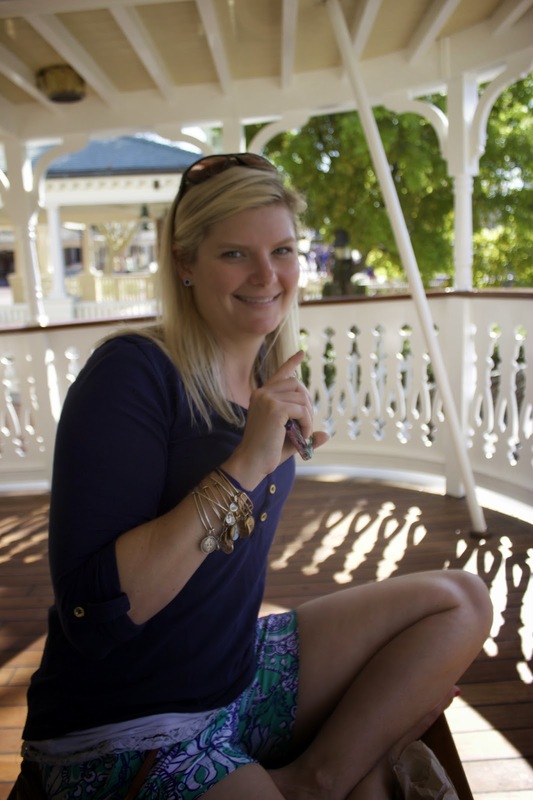 We had dinner reservations at Shula's steakhouse, so we planned to circle the World Showcase and make our way to dinner later in the evening. We started with beers and nachos in Mexico. We also visited our friends in the tequila cave. 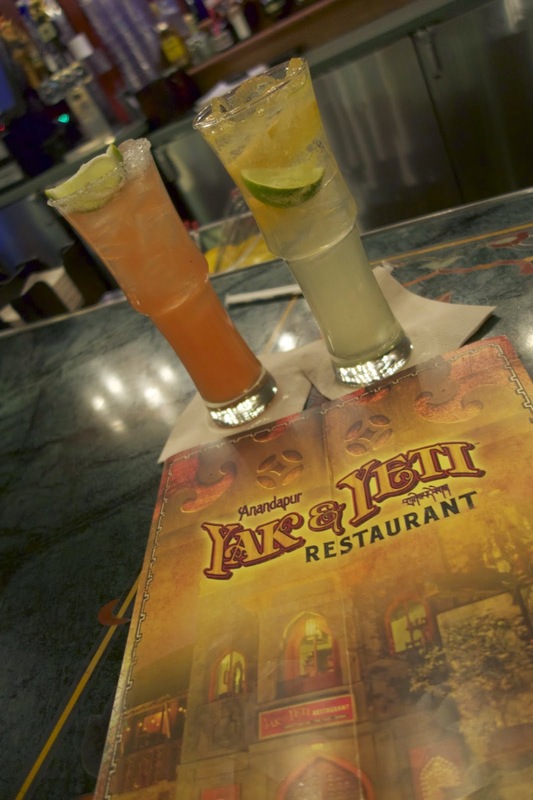 The park was packed-- the line for the to-go bar at La Cava del Tequila was at Food & Wine levels. Tip: When the line is pretty lengthy, it's always a good idea to have one member of your party stand in it, while another goes to check in with the hostess for a seated table. On this particular day, we lucked out and were escorted to a table for two minutes after arriving. 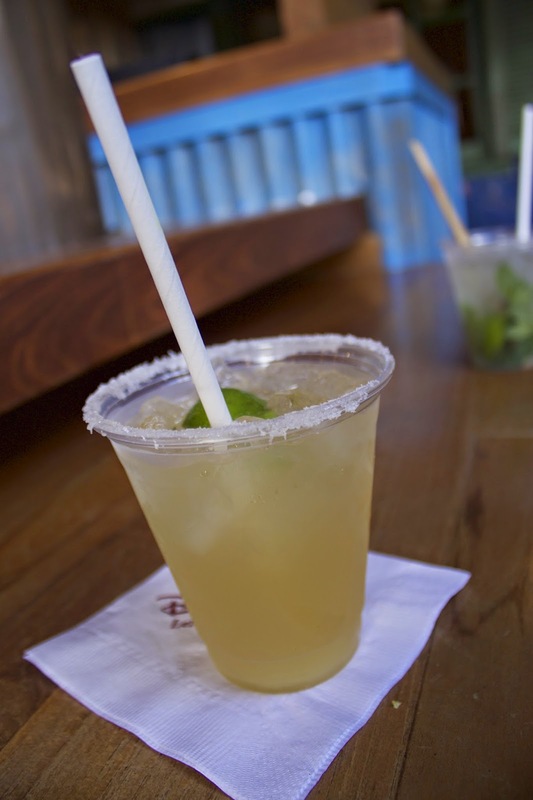 So, we sat and enjoyed our tequila, rather than stand in line and have to slam it at the bar, or find a place to perch in the crowded Mexico pavilion. After a tequila shot, naturally it was time for a photoshoot. 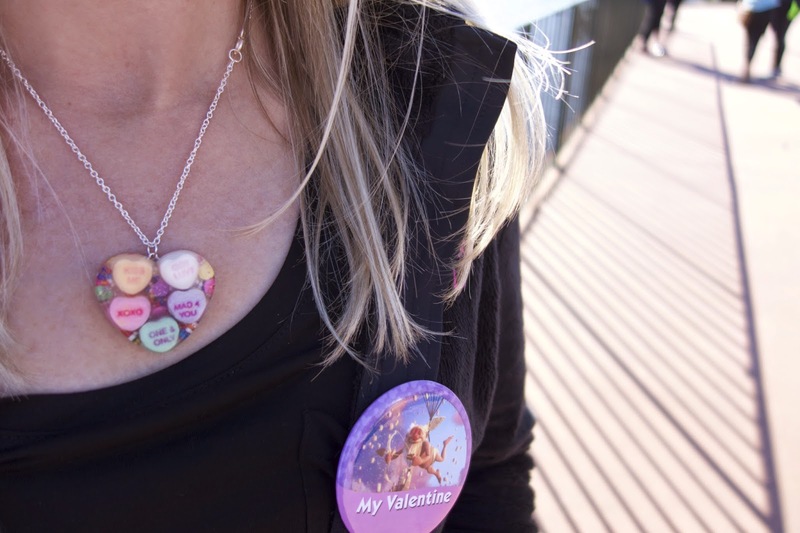 Conversation Candy Hearts Necklace by @sweet_cheeks_ // 'My Valentine' button by @caseyandthebear. Melissa posted about these adorable buttons the other day. Check out the many options available. 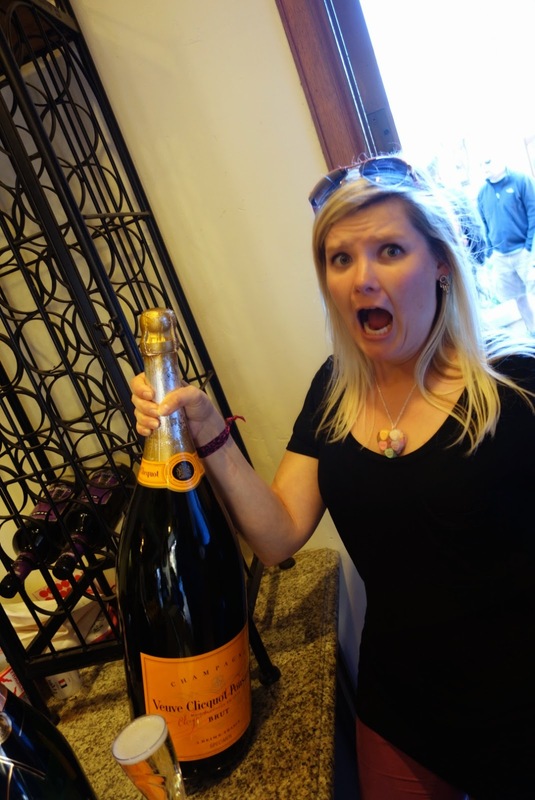 We made our way around to France and splurged on two glasses of Veuve Cliquot. 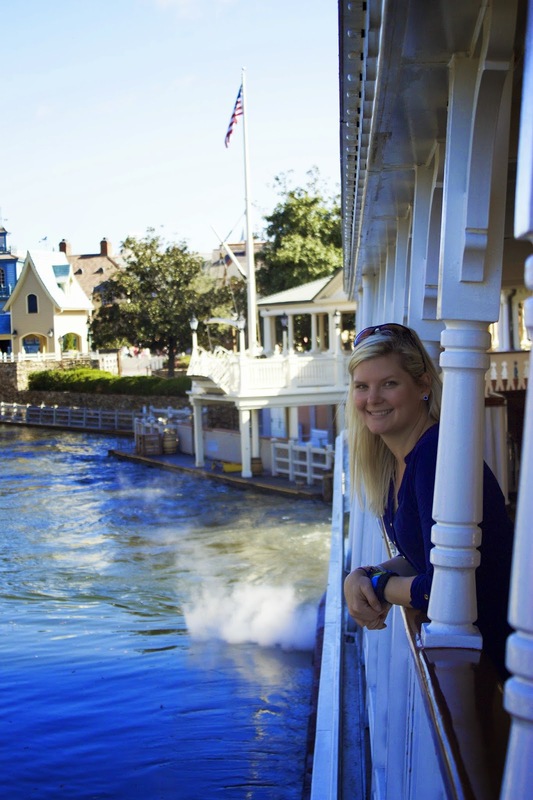 The photo below sums up so many of my favorite things: Epcot, February in Florida, Veuve, spending Disney time with John, and Friendship Boats. The craziest bottle of Veuve I've ever seen. A girl can dream, right?! 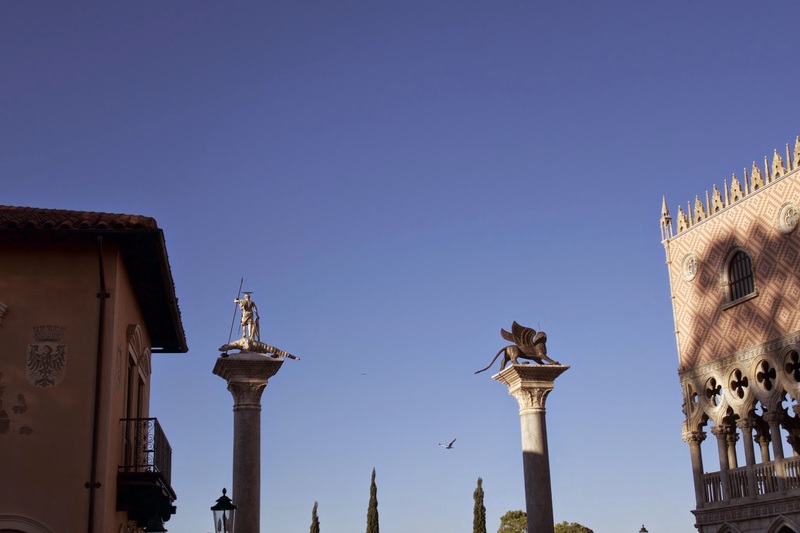 We sipped our way through Morocco, Japan and America until we made it to Italy. Promptly after this following photo was taken, I had a wipe-out of epic proportions. Defying my own logic, I was 'walking and phoning' and missed the last step while walking down the little raised platform area. Wipe. Out. I could hear several audible gasps around me, and a few people came to my side to ask if I was okay. The only thing injured was my pride, aside from scraping up the top of my foot and chipping my toe nail polish, damn it! 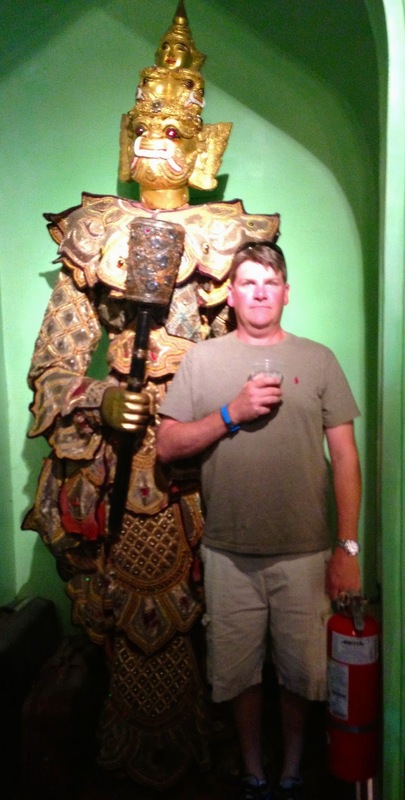 Amazingly John didn't notice it happen, even though he was in line for limoncello a mere 10 feet away. His nose was buried in his phone too. Just as well, really. It was super embarrassing. 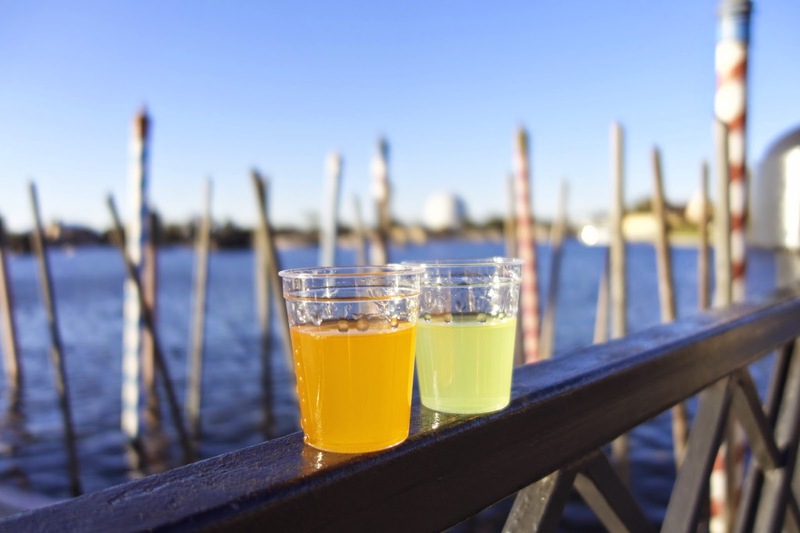 John and I made a new discovery that day-- orangecello! It tasted like Tang vodka. 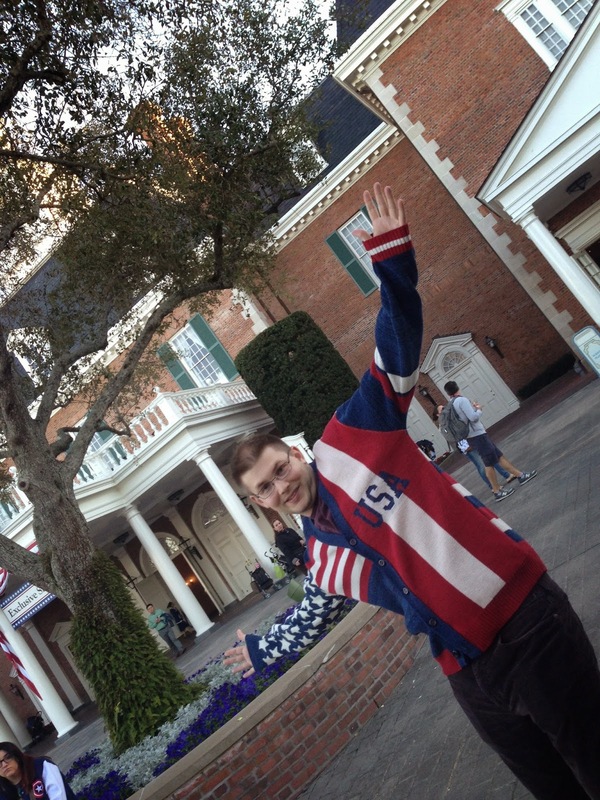 We doubled back at made our way back through America, where John modeled the latest cardigan style. 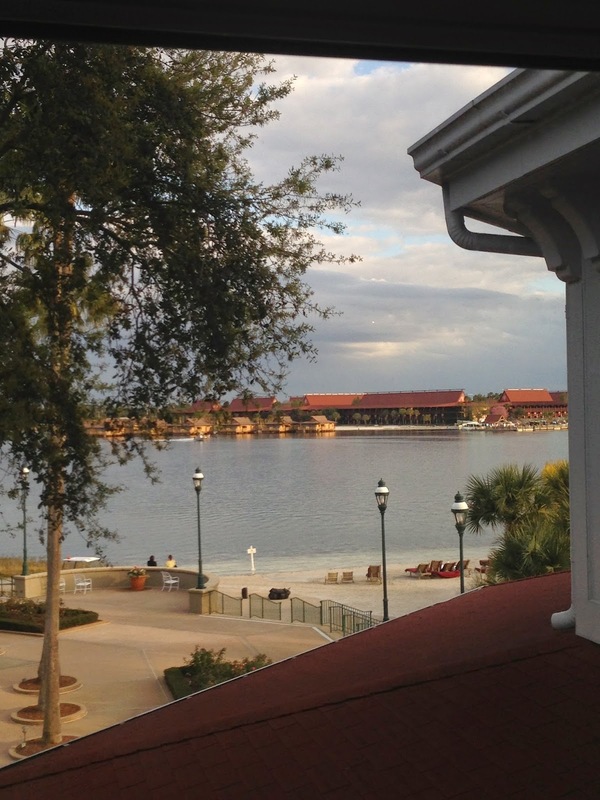 Beautiful golden hour began to descend on World Showcase. 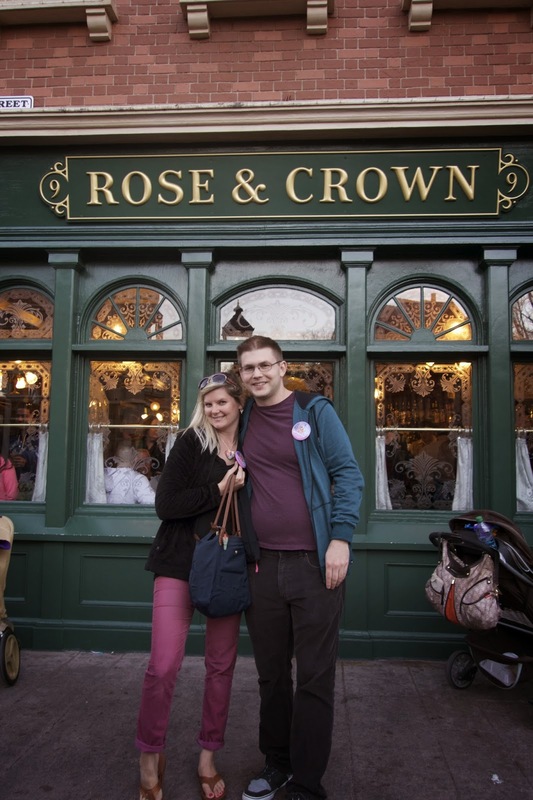 We made one final stop in Rose & Crown. Funny story here. As we walked in, some guy mentioned being a Florida State Seminole fan. I did the Gator chomp to him, which prompted a few others in the bar to do the same. This set off the Seminole fans doing the tomahawk chop and chant, which in turn egged us Gator fans on to do the 'it's great to be a Florida Gator' chant. All of this chanting and cheering had gone on for no more than twenty seconds when a Manager came out of nowhere and told us all to stop it immediately or we'd be escorted out of the park. A while later, the chanting erupted again (this time NOT instigated by me, I promise!) and he swooped in to shut it down again. It made me wonder if they're taking the same stance against the Brazilian tourists, which I hope they are. 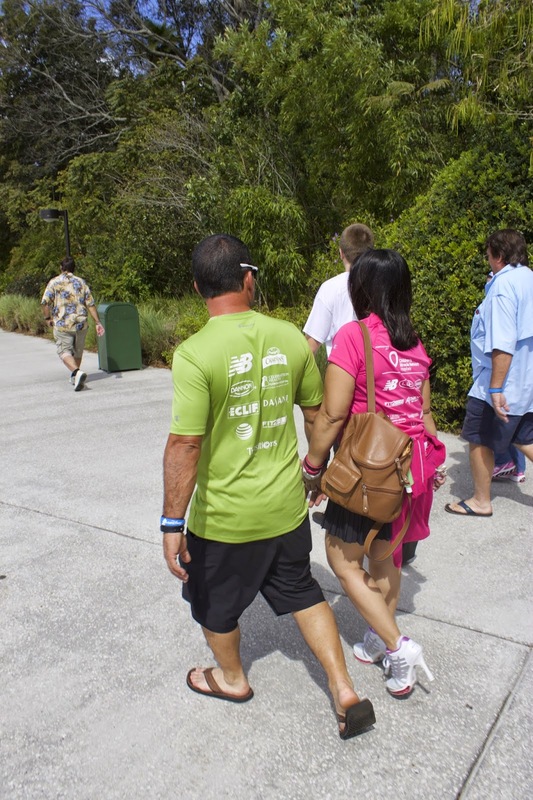 It was time to make our way toward the Dolphin resort for dinner at Shula's. We shared a nice bottle of wine. Our dinners weren't all that great. We both ordered our steaks medium-rare, and they both came out medium-well. We had a side of steamed broccoli which was delicious, and John had a twice baked potato which was just okay. We also each had a wedge salad that was drowning in dressing. The flavor of the steaks were good, but way overcooked. A manager came around to see how our dinners were, and I (nicely) asked him if he thought our steaks had been cooked as we ordered. He vehemently agreed that they were overcooked, and offered to take them off the bill for us. We declined. So you can imagine our surprise when the bill came and our steaks had been removed. It was unnecessary but a much appreciated gesture. Would I go to Shula's again. Eh, probably not. 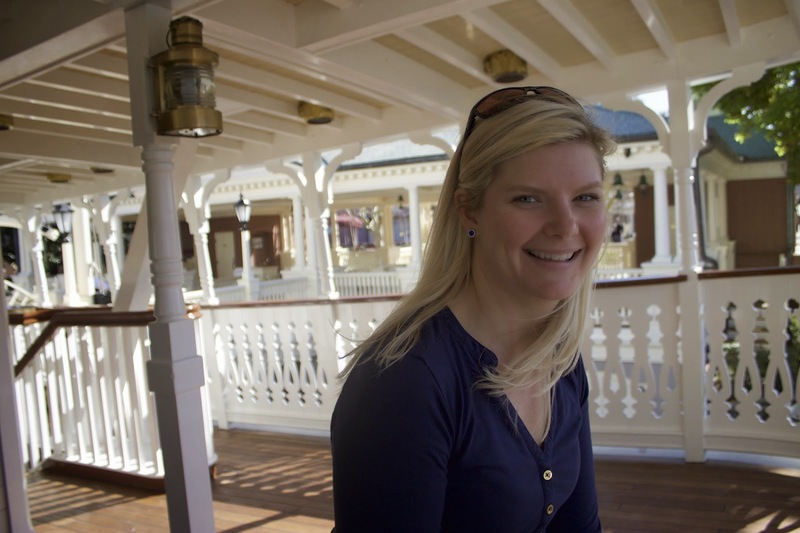 The best steak I've had on Disney property was at Yachtsman's Steakhouse, and would go back there in a heartbeat. We ended up taking a cab home, and returned for John's car the next morning. After such a fun-filled Valentine's Day, and the combination of tequila, beer, champagne, vodka and wine (over the course of nine hours, but still...), all of Sunday was spent much like the cat, below. Except we ordered Chinese and pizza, while she was stuck with dry cat food. How was your Valentine's Day? Thanks for reading!